David J. Benyosef was born in 1986 and raised on the Lower East Side of New York City. He earned a Bachelors degree in Marketing from Franklin Pierce University in Rindge, NH. While attending Franklin Pierce, David discovered glassblowing. After graduation, David has not only taken numerous classes, but also assisted in teaching at The Studio of the Corning Museum of Glass. He continues to create his own unique line of work while residing in Boston. 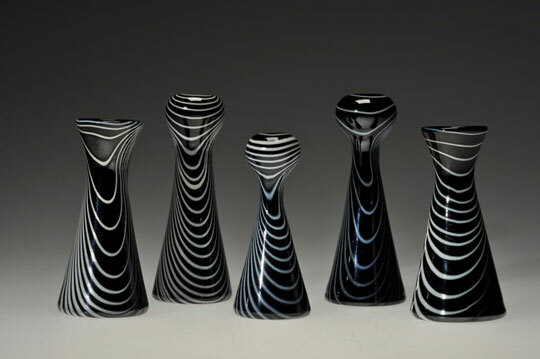 In addition, he is an instructor at both the North Cambridge and Diablo Glass Schools. He also serves as an assistant to many local glass artists. Handblown black glass vase with silver leaf, 6 1/2" x 6 1/2" x 6 1/2"
Handblown black glass cylinder vase with silver leaf, 11" x 3 3/4" x 3 3/4"
Blown-glass pumpkin, orange with silver leaf, 5" x 5" x 6"
Blown-glass pumpkin, orange with purple stem, 6" x 6" x 6 1/2"
Blown-glass pumpkin, purple with green stem, 5" x 5" x 5"